I will admit that these two TE1a live traction engines have been the most difficult restorations I have done for a Mamod engine. I have learnt a lesson. When looking to restore something, look for an engine that can steam up. If you find a engine in 'spares' condition, as well as cleaning it up, you will also have to repair it which will take up a lot of time and money. What I decided to do was entirely wrong (but, in the end, it worked out ok). With the engine that was covered in pure black paint, I decided to repaint that to the TE1a green. With the other engine that originally was green, I took the paint off to make it into the brass TE1a version. I should have done it the other way round. However, both engines ended up looking great! For the engine that is completely black, I had to buy a new crankshaft and flywheel as well as a water level plug. The chimney was not Mamod's official chimney which meant there was nowhere for the exhaust fumes to go. The other engine features a new sight glass, a custom lamp and re-soldering of copper pipe joints and whistle. In total, a lot of work went into these engines: it was not an easy task restoring these engines! Anyway, I hope you enjoy the before and after pictures - I definitely do! 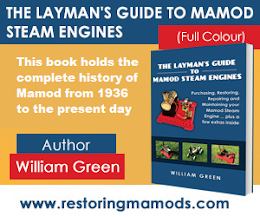 From the pictures, it is clear that the best restoration of the three was the second Mamod TE1a Brass engine. The contrast between the wheels and brass work just cannot be beaten! Hope you have enjoyed looking at the pictures as much as I have!